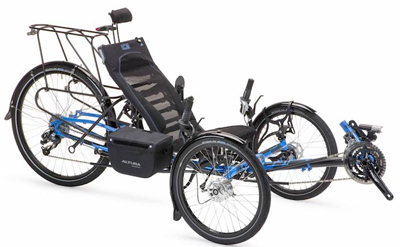 All-terrain trikes tackle rough roads, or no roads at all. They tend to sit high, with a high ground clearance. Suspension benefits off-road use, but the key aspect is high ground clearance, so not all suspended trikes are suitable for the dirt. Many use larger diameter wheels all around, along with wider tires. For higher speed uses we don’t recommend using large diameter front wheels due to the side forces that these wheels take in hard turning. But for creeping around in the sand and mud these big wheels work. Some people just don’t have good roads to ride on, but if you have a lot of land to patrol or access to mountain biking trails, these trikes are the ticket. 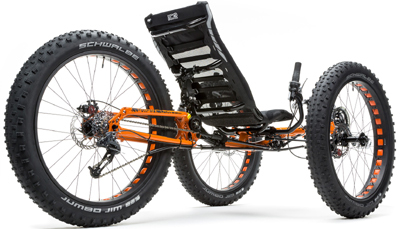 The development of fat tire bikes spurred the design of all-terrain trikes. TerraTrike released an early version of their All-Road model at one of our rallies a few years ago. It featured double-wide 20″ tires. The ICE Full Fat uses three 26″ fat tires. 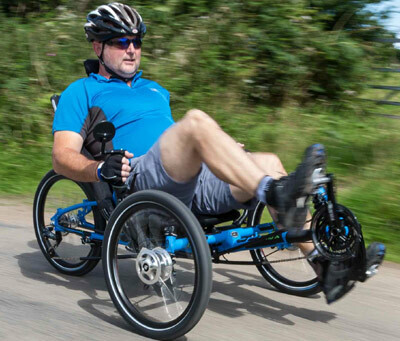 The Full Fat offers full suspension as an option, making it the ultimate off-road trike. 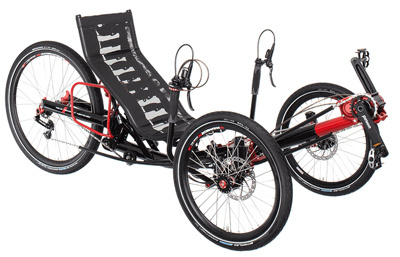 AZUB offers a 26″ fat tire trike, developed off their T-Tris frame, but it doesn’t have a suspension option yet. TerraTrike offers the Rambler All-Road as a stock model, but you can upgrade any Rambler or Rover to 24″ wheels all around using a conversion kit.